Christmas beer season in Denmark is a celebration! 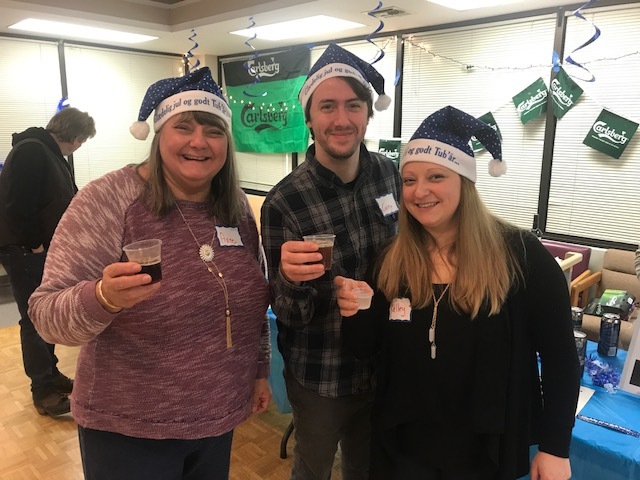 The Danish Christmas Beer Fest at the Seattle Danish Center brings the festivities to the Pacific Northwest! Taste various Christmas brews, cider, and aquavit while you snack on Danish Christmas treats. We’ll have games and prizes too! Non-alcoholic beverages will be available. Experience this annual tradition from Denmark. You must be 21 + to consume alcohol at this event. Mikkeller Brewery was founded in 2006 in Copenhagen, Denmark by Mikkel Borg Bjergsø and Kristian Klarup Keller. Mikkel and Kristian spent years experimenting with home brewing and various recipes before the now internationally-recognized Mikkeller brewing company came to be. Mikkeller’s award-winning beer has twice been rated fifth best brewery in the world and won the “Danish Brewery of the Year” award in 2006, 2008, and 2009. Beer from Mikkeller brewery can now be found in over 40 countries. Mikkeller bars have also surfaced across the globe, in Bangkok, San Francisco, Stockholm, and other major cities. Evil Twin Brewing was founded in 2010 in Denmark by Jeppe Jarnit-Bjergsø. Known for its rare and ‘funky’ flavors, Evil Twin produces a wide variety of beer they brew as a ‘gypsy’ brewery around the world. Check out their variety at eviltwin.dk. Since 1846 Aalborg Akvavit has been a central element in Danish celebrations, especially around Christmas time for a traditional Danish Julefrokost (Christmas Luncheon). It has become the best-selling spirits brand in Denmark. At the Danish Christmas Beer Fest we will be serving Aalborg Jubilaeums Akvavit. This is a milder akvavit with a base of dill and coriander, rather than the typical caraway. Aalborg Akvavit is not yet available in WA State, but on Friday you can taste the spirit at the Seattle Danish Center and even have a chance to take a bottle home!